This coming Thursday, there will be a Press Conference at the Holy See Press Office to present a document of the Congregation for Catholic Education "Guidelines for the Use of Psychology in the Admission and Formation of Candidates for the Priesthood." The speakers at the press conference will be Cardinal Zenon Grocholewski, Prefect of the Congregation for Catholic Education, Archbishop Jean-Louis Brugues, Secretary of the Congregation, and Fr Carlo Bresciani, a psychologist and a consultor to the Congregation who has written on bioethics and sexual morality. Here is the original (Italian) announcement in the Vatican Bollettino. And here is the Catholic News Services story. CNS reports that the Congregation has been working on this document for at least six years and notes that the pyschological testing of candidates for the priesthood is a controversial issue at the Vatican. I would agree that some sort of psychological evaluation of candidates if a fairly obvious necessity but I'm nervous about the use of psychometric testing. Many years ago, I actually did a degree in psychology (joint with philosophy) at Oxford. From that time, I picked up a skepticism about the validity and methodology of psychometric testing. The book "After Asceticism" which I reviewed in the Jan-Feb 2008 Faith Magazine, criticised the use of a secular "therapeutic mentality" and referred favourable to the work of the Catholic psychologist, Dom Thomas Verner Moore in the first half of the 20th century. It seems to me that the "therapeutic mentality" still influences some of the use of psychology in the Church, and that we have not adequately taken account of the scathing indictment by William Coulson of the work that he participated in with Carl Rogers. (See for example:Carl Rogers and the IHM Nuns: Sensitivity Training, Psychological Warfare and the "Catholic Problem" and "We overcame their traditions, we overcame their faith." For various reasons, then, I look forward to reading the new document from the Congregation for Catholic Education. 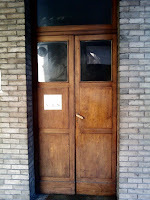 The door pictured above is in the entrqance to the Vatican Information Services office on the Via Dei Corridori. 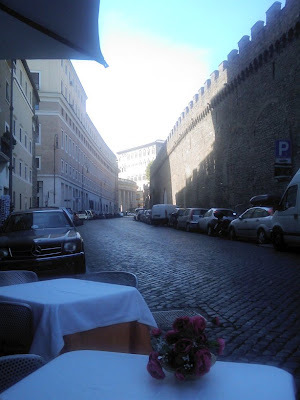 We were staying at the Hotel Bramante just off this road last week and the restaurant just across the road was the Osteria San Pietro at which we lunched one day. I just noticed in the photo that not only do you have a clear view of part of the colonnade of the Piazza San Pietro, but also of the window from which the Holy Father gives his Angelus address each Sunday.